Spaniards and citizens of the European Union: Free Admission. 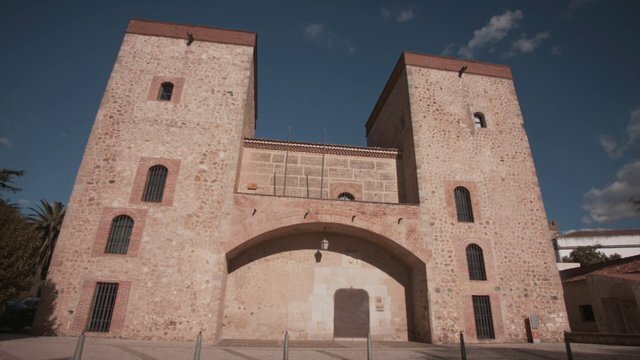 The Dukes of Roca's Fortress-Palace, built in the 16th century by the Suárez de Figueroa family, houses the Badajoz Provincial Archaeological Museum nowadays. Located in the old part of the city, this museum was founded in the 20th century with the intention of safeguarding the art and heritage proceeding from the sale. It is well worth a visit nowadays if you happen to be in the city. In the upstairs room, you'll have the chance to contemplate the prehistoric remains the city encloses. In the mezzanine, you'll find the Roman remains found in this area, objects that complement the collection kept at the National Roman Art Museum in Mérida, where other aspects of the life of the Empire's first settlers are on display. Then, on the building's lower floor, you'll discover four exhibitions on the late Roman period and beginnings of Christianity, the decorative architecture of the Visigoth era, the Islamic era in Badajoz and the Christian late Middle Ages. Between all the rooms, you can enjoy over 20,000 pieces that will help you learn about the history of this territory from its origins up to nowadays. What's unusual about this museum might be the fact that the building it is in makes it one of the oldest museum centres in Extremadura, as it is situated in the Moorish Alcazaba citadel, and it displays collections that are unique in Europe, such as the one on the Orientalizing period or the Bronze Age warrior stelae. Don't hesitate.